Lemon Rice..where do I start. I wasn't on the list of my favourite dishes till I met my husband. In some parts this dish is cooked without adding onion and the dish is generally a little too dry for my taste. After my husband cooked this one.. I am now loving this dish. I am sharing that he uses to cook it and my does he use onion for it! If you have no veggies at home and all you can find in your pantry are onions... this is a nice dish to whip up quickly. You can also make the gojju or the base for the dish and store it for a day or so. So, here's presenting my husband's favourite dish.. He claims that he loves this dish so much that he would never get bored of it and can eat it every day! That pretty much sums up how much he loves this recipe. I hope you love it as much as we do. Boil the rice and leave it to cool so that the grains are not sticky and mushy and are separate. Roast the ground nuts and grated coconut each separately and keep them aside. Heat the oil in a pan and add the mustard seeds, cumin seeds, curry leaves and slit green chillies. Fry till the spluttering stops and add the finely chopped ginger. Then add onion. Saute till the onion becomes translucent and softens. Add the turmeric powder and grated roasted coconut. Fry for another minute and switch off the stove. When you are ready to serve the dish, add the rice to the mixture. Then add the lemon juice, salt and groundnuts and serve immediately. 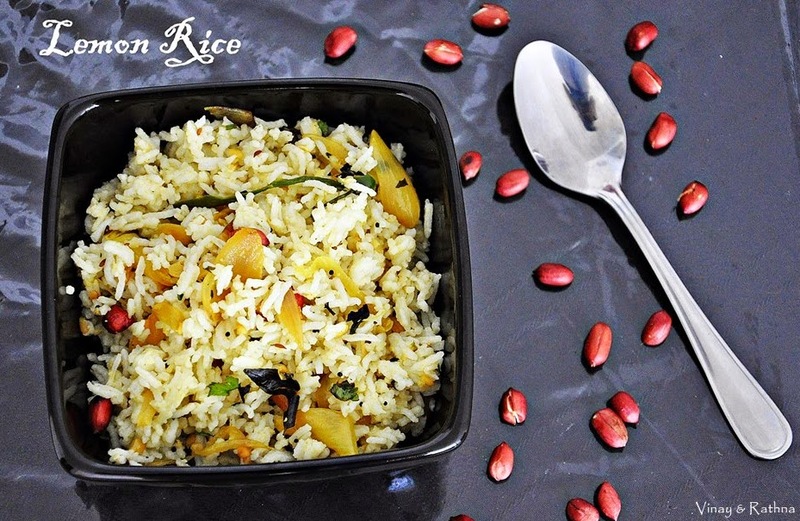 If you have leftover rice in the fridge, this recipe is a great way to use up that rice. Chop onion in thin long slices for this recipe. Don't add the groundnuts in advance as they tend to become soggy. The groundnuts give a crunchy texture to the dish.